Milfoil has feather-like leaves that are finely dissected to the midrib and whorled around the hollow stem along the entire length of the plant. Milfoil stays submerged except for a stalk of tiny flowers, which can extend above the surface. 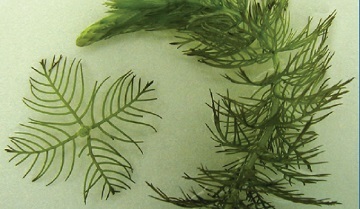 Milfoil has finely-divided leaves which are whorled around the stem. The hairs sticking out of each leaf are called leaflets. If there are 5–10 leaflets on the leaf then it is Northern Water Milfoil; if there are 12 or more leaflets then it is Eurasian Water Milfoil. Multiple species of Milfoil are common across the United States. Overpopulates and chokes out any other species of plant in the location it inhabits. A very aggressive invader. Seeds can spread Eurasian Water Milfoil or fragments of the plant will spread. This plant should not be spread, since it is a problematic, non-native weed. Dibrox®, Navigate pellets, and liquid 2,4-D are great for treating Milfoil species.